So now that you have an overview of the products available to you and what we will be using, it’s time to setup your new reseller account. First thing we will do is setup nameservers. This is what your clients will have to enter at the registrar level (who the domain is registered with) for their domain to point at our servers. 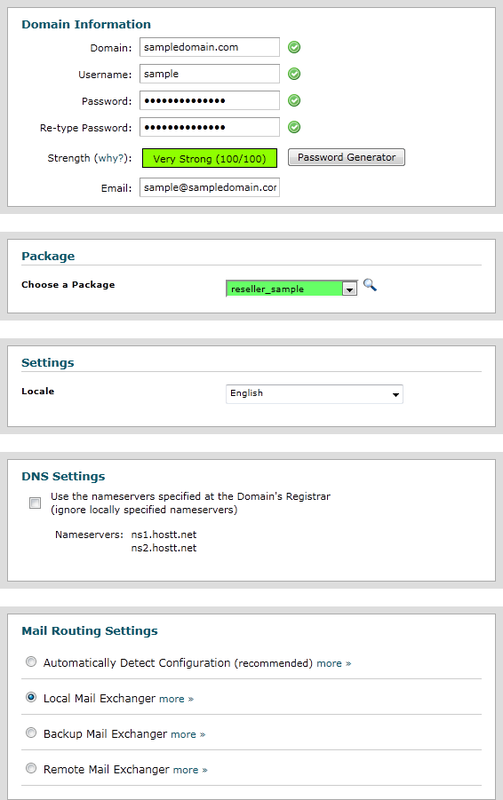 You can either use our nameservers that are already setup (ie [NAMESERVER1] or [NAMESERVER2]) or setup your own nameservers with your domain (ns1.yourdomain.com, ns2.yourdomain.com). You just use the IP addresses from our nameservers but register them with your registrar as your own nameservers. If you are unsure which nameservers of ours you should use, or how to set it up, please contact support. Max Parked Domains: Parked Domains (Domain pointers) allow you to "point" or "park" additional domain names to your existing hosting account. This will allow users to also reach your website when entering the "parked" or "pointed" domain into their browsers. 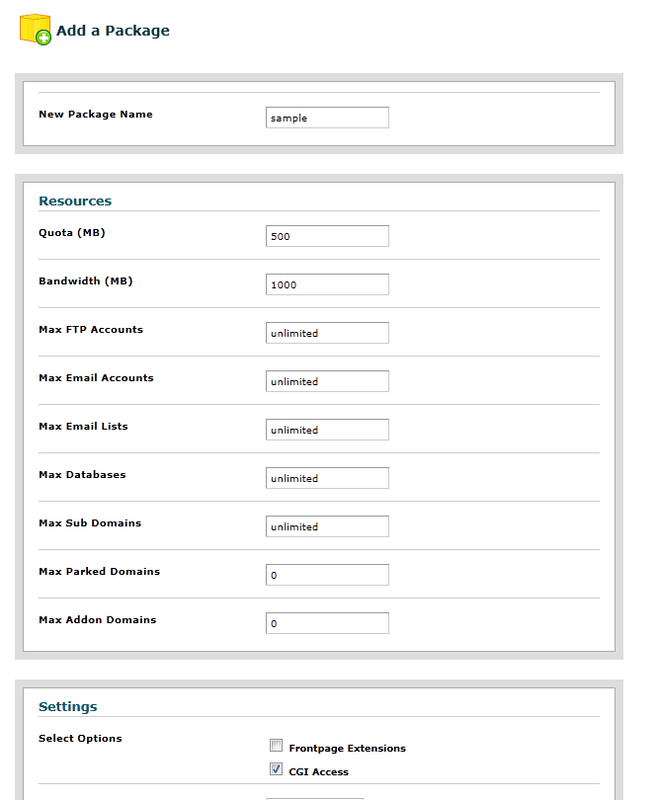 Max Addon Domains: addon domains are additional domains that can be added and hosted by that account. Meaning you can have your website abc.com and abz.com under the same account. After you have entered in everything click on the “Add” button. 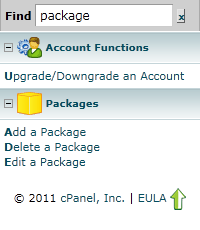 You have now created a new cPanel package. Click on “Create a New Account”, this will open up a new page where you will enter in all the information for the new account. Under Domain Information enter the new accounts domain name, username, password, and an email to associate the account with. Under Package, select the package that you just created. Under Settings, choose the language for the account. Under DNS settings you can leave the checkbox unchecked, this would be for a more advanced administrator, if you have questions about it please contact support. Once you’re ready click Create! Now you just need to change the nameservers for that domain you setup to the ones we created earlier in this guide. Now that you’ve created a new account, in that same FIND box type in “list”, and then click on List Accounts. This will then display all the current accounts that are hosted under your reseller account as well as your complimentary account. As you can see above, our main account is hosttreseller.com and sampledomains.com is the sample account we setup. If you look under package you will also see that the main domain is under the EF1 Reseller package and the sample account we setup is under USERNAME_sample (USERNAME will be your specific reseller username). 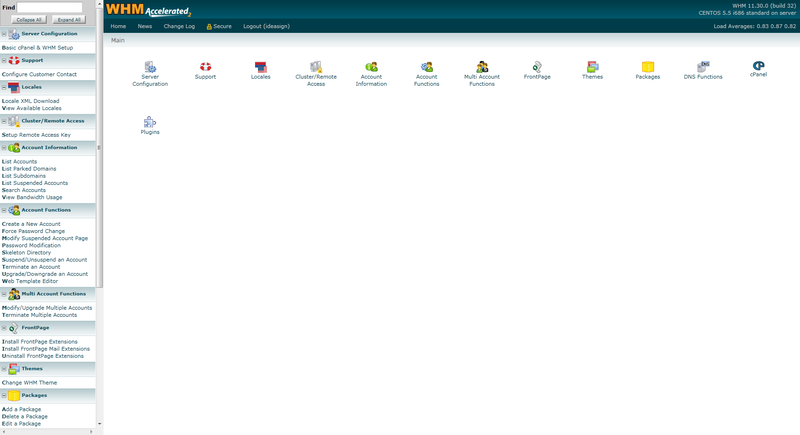 If you would like to login to either of the cPanel accounts, there is a cPanel icon and all you need to do is click on it. Please do not click on anything that you are not sure what it does. Please do not try to alter the WHM Theme from the selection box - fatal errors may occur. If you are unsure about anything please do not hesitate to contact us, we are available 24/7 every day of the year, with support ticket average response times under 10 minutes! A support technician will help guide you through any issues or questions you may have.